Yeah yeah yeah, everybody says that on New Years Eve/Day. How “this year is gonna be different” and yadda yadda. Well for my family, 2016 is going to incredibly different. Why? Because we took the time and put in the effort back in 2015 to make it so. In 2015 I became a full time Stay-At-Home Dad and it’s been working out better than I could have possibly hoped. Staying home with the little one and getting to concentrate further on projects that mean something to me has been truely amazing. My Wife got an awesome new position at work in which she quite comfortably accells and looking ahead, there are some wonderful opportunities for her coming up. The little one? She just started potty training full-time and she’s a CHAMP. All of this is in addition to a steady change in our diet to healthier things that still satisfy us, and most importantly…..a new home. A full on HOUSE. No more renting, tons of space and a world of opportunity. We worked very hard to get to this point at this stage in our lives and this is one of those times when we can truely look behind us at what we’ve done and reap the benefits of our hard work. The best part is, though, that the work is only truely just beginning. My Wife and I are both the kind of people who like to stay busy as much as we like to relax. Now, we have a home where both things are possible. We have enough comfy space to curl up and watch TV and play with the little one, and a good amount of space to work on all the things we dream about. 2016 so far is full of some all new things and good feelings that we haven’t felt in a long time. Yeah, you read it correctly. “Season 2” is coming and you may be thinking to yourself “hey Ben, I didn’t think your show worked that way” and initially, you’d be correct. This week though comes a big change to my family and Lazy Banana Podcasts. I’m happy to say that we’ll be relocating to an amazing place in which it will be possible to not only have better quality shows, but also more regular content. With that in mind, as well as the stints I’ve had to do in the first “season” where I wasn’t able to do shows at all, I’ve decided that with all the differences that there will be between the shows prior and the shows coming up, it makes sense to seperate them into “seasons”. 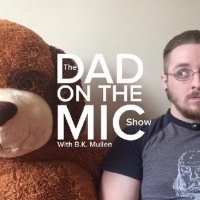 And so, for your enjoyment, starting THIS VERY MONTH…all new episodes of The Dad On The Mic Show. Regular guests from different areas of expertise. I’m incredibly grateful for all of you who have stuck with me, and everyone who’s coming in at this exciting time of growth! Don’t forget to subscribe to the show via iTunes, and go follow on Twitter and Facebook!